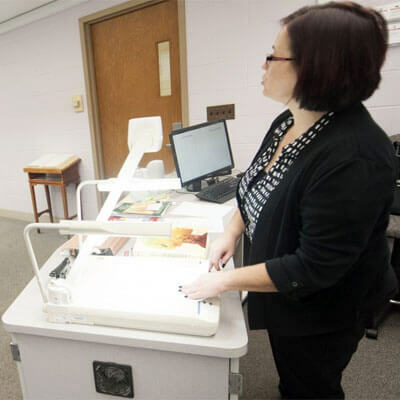 Sonya L. Armstrong, an associate professor in the NIU College of Education and program coordinator for the college’s new online postsecondary literacy certificate, works with technology in her classroom. All are welcome Thursday, March 26, to join the NIU College of Education for a spring tradition: the Community Learning Series. During this semester’s “Innovation in the Classroom” discussion, a panel of NIU alumni will share their experiences in introducing innovative teaching methods and ideas into their classrooms. Topics include literacy, special education and technology and science in the classroom. Panelists are Renee Gust, Meg Van Dyke and Maria Walther. Laurie Elish-Piper, director of the Jerry L. Johns Literacy Clinic and Presidential Engagement Professor and Distinguished Teaching Professor in the Department of Literacy and Elementary Education, will moderate. Free and open to the public, the event will take place in the ballroom of Altgeld Hall. A reception with heavy hors d’oeuvres begins at 5 p.m. The discussion begins at 6 p.m. Registration is available online. For more information, call (815) 753-8370 or email kbraser@niu.edu. Gust is the owner and director of Kids Connection in St. Charles. The 6,400-square-foot center offers early childhood education programs and summer programs for school age children, with an emphasis on play-based curriculum. The center also offers full-day preschool, and extended care for school age children, as well as part-day preschool programs. Gust has made caring for children with special needs a mission of the center, because she feels that finding childcare is especially difficult for families of special needs children. The center has equipment and therapy consultants from the school districts and community to help in those areas. Van Dyke is a seventh-grade teacher at O’Neill Middle School in Downers Grove and a recent honoree of the prestigious Golden Apple Award. 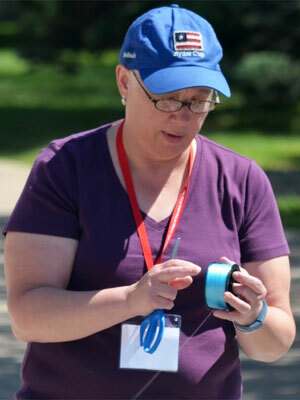 She has spent four summers working alongside faculty in the NIU Department of Education Technology, Research and Assessment to host “Argue Like a Scientist,” a summer camp for middle school children. The camp’s goal – fostering a love of science and research in children – is what led Van Dyke to a career in teaching. Her classroom is “off the grid,” meaning the classroom is fueled entirely by alternative energy sources, enabling her students to learn firsthand about these sciences. She has become adept at gaining grant funding for all kinds of creative classroom experiences for her students, fueling their interests by exposing them to engineering, innovation, research, technology, and whatever else interests them. Van Dyke has been particularly successful at getting girls in her school to love science. Walther has taught first-grade since 1986. Along with teaching young learners, Walther inspires other professionals by sharing her knowledge through customized professional development experiences and by teaching courses in the master’s in literacy program at Judson University. The ideas she shares reflect her continued commitment to teaching, researching, writing, and collaborating with her colleagues. Walther was honored as Illinois Reading Educator of the Year (1997), earned the ICARE for Reading Award for fostering the love of reading in children and, in 2014, was named the Outstanding Literacy Alumni by Department of Literacy and Elementary Education. She has co-authored five professional books and the “Next Step Guided Reading Assessment” with Scholastic. Previous Post:Winter’s still here: Let’s be careful out there!